Lack of political will on both sides of the negotiating table continues to undermine efforts to resolve the war in eastern Ukraine. Unless Ukraine, Russia and pro-Russian separatists can reach a compromise, rebel-held territories look set to become another “frozen conflict” zone in the former Soviet Union, writes SAIF ISLAM for S-RM. The first four-ways talks on Ukraine in over a year on October 19 ended with little change in the status quo. German Chancellor Angela Merkel had invited her counterparts to Berlin with the hope of reviving stalled peace negotiations. While an agreement was reportedly reached to establish a new road map to implement the Minsk peace deal, there were no major breakthroughs, a widely expected outcome. There was tentative agreement on expanding the Organisation for Security and Co-operation in Europe mission in eastern Ukraine, although the exact details have not been decided. Even if a road map is drawn up as early as the end of November, as suggested by Ukrainian President Petro Poroshenko, it is unlikely to significantly change the status quo in eastern Ukraine. Lack of political will from all parties to compromise is slowly turning the rebel-held Donetsk and Luhansk regions, collectively known as the Donbas, into another “frozen conflict” zone in the former Soviet Union, similar to the likes of Nagorno-Karabakh or Transnistria. The Minsk agreement, drawn up in February 2015 after the failure of the first peace deal, has de-escalated the ongoing conflict between Ukrainian troops and pro-Russian separatists. However, the first provision of the agreement – an immediate and full ceasefire – has been largely disregarded. 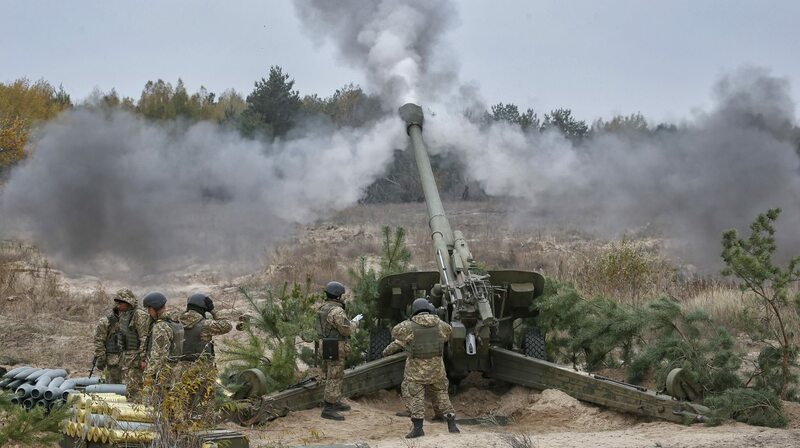 Ceasefire violations have become the norm, and all parties appear comfortable with this status quo, perhaps calculating that full implementation of the Minsk agreement could be more politically costly than beneficial. With each side prioritising different provisions of the agreement, consensus on implementation is unlikely. For the Ukrainian government, a complete ceasefire, gaining full control of Ukraine’s border with Russia, and the withdrawal of foreign troops from Donbas remain the most important provisions. In this regard, Russia’s frequent troop mobilisation near the Ukrainian border continues to stir fear in Ukraine, and across Europe and North Africa, that Moscow intends to destabilise Ukrainian domestic politics by maintaining a constant military influence in eastern Ukraine. However, the separatists would much rather remain heavily armed, and under Russian military protection, than be part of a fully sovereign Ukraine. For the separatists and Russia, local elections in Donbas, and greater autonomy for this region, are the fundamental provisions of the Minsk agreement. However, the Poroshenko administration is opposed to these demands unless its favoured provisions are implemented first. Ukraine is yet to pass laws that would govern the local elections in Donbas, and there is vehement opposition to the elections inside Ukraine. Similarly, in August 2015, when a Poroshenko-backed bill on autonomy was presented to the Ukrainian parliament, there were violent anti-government protests by nationalist groups. The bill passed the first reading in parliament on that occasion, but it is unlikely to pass the required second and third readings in the current political climate. Poroshenko has since backtracked on the autonomy issue. Disagreements between the Ukrainian government and separatist groups regarding the terms and implementation of the Minsk agreement raise questions about the overall commitment to negotiating a lasting peace deal. The separatists, who previously advocated for integration into Russia or full independence for Donbas, probably never accepted the Minsk agreement. They are not involved in direct negotiations, and reports suggest that they initially refused to sign the agreement and only changed their minds following Russia’s insistence. Similarly, Poroshenko’s government probably initially believed that if Ukraine had received enough military support from the West, pro-government forces could have achieved outright military victory in eastern Ukraine. Regardless of what their initial calculations were, the status quo currently suits all parties involved, and potentially even in the longer term. The separatists are highly distrustful of Poroshenko’s administration, recently accusing it of killing separatist commander Arseny Pavlov on October 16, and vowing to take revenge. Poroshenko, on the other hand, probably realises that complete implementation of the Minsk agreement would require him to fund the reconstruction of Donbas, a region that will probably never fully return to the Ukrainian fold or support its pro-Western trajectory. Moreover, although Poroshenko would gain the respect of his Western allies by prioritising some of the Minsk provisions favourable to the separatists, he risks alienating his political allies and emboldening the opposition, who are against granting any concessions. Saif Islam is a Russia-focused analyst at S-RM, a Cape Town-based business intelligence and risk management consultancy.